This is where the fun begins! In our Raleigh Design Center you will work with a professional Design Consultant to put all the finishing touches on your new home! From flooring to cabinets to paint colors and everything in between – it's all here under one roof! 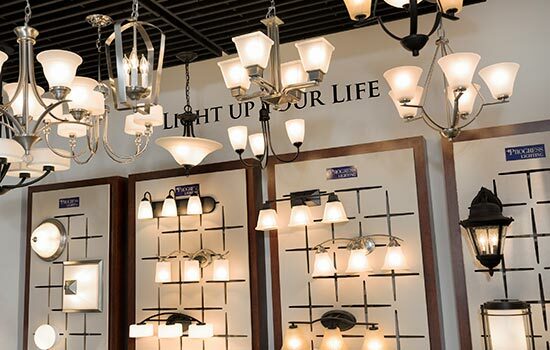 At the Design Center, you’ll discover thousands of incomparable Custom Choices™ available to personalize your home. From elegant flooring and cabinetry, to versatile countertops and appliances, our Design Center’s variety of choices is sure to jump-start your imagination. Everything you can imagine for your new home is in the Design Center. Whether your style is traditional or contemporary, or if you’re looking for a special type of tile or fixture, you’ll find it here! And, to help you stay within budget, as well as coordinate your selections, a Design Consultant will be right there with you. Our Design Center is open by appointment only, so please contact us at 919-659-1500 for more information. From I-40 West: Take Exit 287 for Harrison Road. Use the left 2 lanes to turn left onto N Harrison Ave (signs for Weston). Travel .3 mile and turn right into the parking lot across from SAS. The Design Center will be in the building on your left. From I-40 East: Take Exit 287 for Harrison Road. 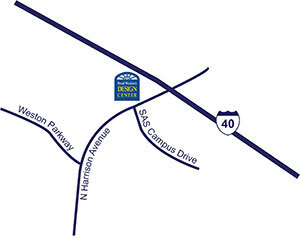 Use the right lane to turn right onto N Harrison Ave (signs for SAS Campus Drive). Travel .1 mile and turn right into the parking lot across from SAS. The Design Center will be in the building on your left.